The balance of water and paint is a diligent process of mixed emotions. Painting with water and color signify gallantry, radiance and liveliness. Watercolor painting classes are a gateway to building support systems. Sadhu Aliyur is one of the most prestigious watercolor artists of all time. He expertise in realistic watercolor painting. Every little thing in nature inspires him. In fact, I am always thrilled to see his visions come to life. He mentors the students at Sampratishta. Sampratishta provides a source of guidance to all the aspiring artists. They provide basic sketching classes followed by color theory to outdoor painting classes and so forth. Also, practical learning is always more fun and beneficial. I got a chance to visit one of his classes where the students were learning ‘color theory’. Mr Aliyur imparts the basic technicalities effortlessly. In fact, his deliverance and skills awe-struck me. Also, his way of drawing attention from students is commendable. He attends every student personally and rectifies them with patience. Needless to say, he makes sure each stroke is perfect. In addition, he teaches about the different aspects of mixing in a palette and not on paper. Likewise, he talks about the amount of color used for a broader spectrum. He also ensures the amount of water to use. Besides, he suggests the type of brushes for precision. Thus, students learn to shade the gradients of colour with comfort. His dedication to technicalities of watercolor painting is remarkable. Mr Aliyur establishes a concept of ‘no mistake theory’. Any slip switches to a fresh new trial. As a matter of fact, the students improve their motor skills by more practice. I learnt a lot in a single day. Needless to say, the complete experience of the program is unimaginable. 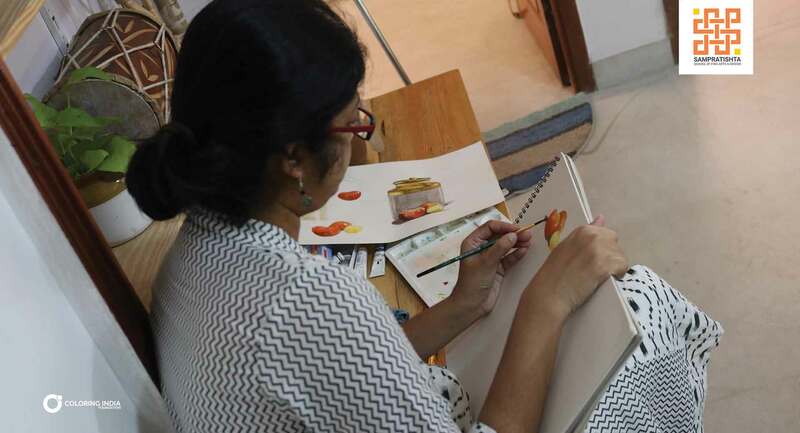 Bangalore has limited options for momentous watercolor painting classes. On the contrary, Sampratishta by Coloring India Foundation has shed light upon all the zealous artists. In fact, they are the first Art School to provide Diploma courses in Fine Arts & Visual Arts. International and national veteran artists mentor the students personally. They prefer limited students with unlimited passion. Hence, get yourselves enrolled at the earliest.